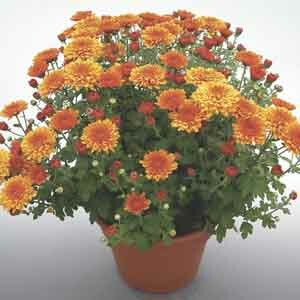 One of the most popular plants available for providing long-lasting flowers to enjoy indoors or on porches and patios. Often sold as a gift plant because they are so easy to care for. The wide array of colors and flower forms insure there is a shade to suit just about any indoor décor or patio planter color scheme. Perfect for all kinds of containers. Makes a breathtaking potted specimen plant. May be displayed outdoors in warmer weather. Makes a lovely gift! Keep soil moist throughout growth and bloom season. Fertilize regularly for best display. Keep away from drafts. Remove faded flowers. If the plant was purchased in a pot, then it is probably already in a quality potting soil and requires little more than watering and grooming for a while. If potting a flowering plant to bring indoors or to give as a gift plant, start with a good quality, commercial potting soil. These are usually lighter in weight than topsoil, sterile and pest-free. Many are available with a mild starter fertilizer in the mix. Prepare the container by filling with potting soil up to 2” (5cm) from the rim of the planter. Make a small hole in the soil slightly larger than the root ball either by hand or using a trowel. Insert the plant into the hole and press soil firmly around the roots and just covering the root ball. When all the plants are potted, water thoroughly to settle the soil and give plants a good start. Place plant in bright location for best performance. Most potted flowering plants prefer consistently moist but well-drained soil. If the soil gets too dry the blooms can wilt and they may not recover. Check the soil moisture with your finger. If the top 2-4” (5-10cm) of soil is dry, or plants are wilted, it is time to water. Slow-release fertilizers are an especially good, care-free choice for container plants. Follow the product directions for proper timing and application rates. Remove the flowers as they fade. This keeps the plant looking tidy and may encourage more blooms depending on the type of plant. After flowering many blooming plants make attractive houseplants. Be sure to trim the foliage to maintain the desired size and shape. Occasional trimming encourages the plant to develop more side-shoots and flowers, and reduces the demand for the plant to develop a larger root system. This is important since the roots are in a confined space. Some plants will re-bloom on their own, but others may have very specific day-length or temperature requirements to flower again. A bit of research may be necessary to determine what is needed to encourage future blooming. Some plants, such as bulbs or perennials, can be turned into wonderful garden additions after the flowers have been enjoyed indoors.